Welcome to Telling Kids the Truth. I am delighted to be hosting Nonfiction Monday, so, if you'd like to join in, please leave your name, your link, and a description of your post in the comment section below. I'll add links throughout the day, so check back later for a full list. 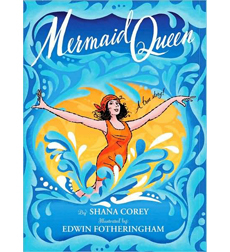 I will start us off with a review of MERMAID QUEEN written by Shana Corey and illustrated by Edwin Fotheringham. 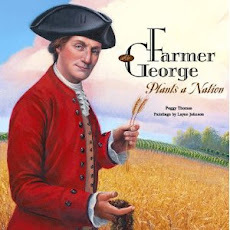 It is a 2009 title from Scholastic, but it is a recent addition to the children’s biography section at the Middleport Free Library, so I snapped it up. In this book, I found a lovely colorful biography of an equally colorful woman named Annette Kellerman who swam to fame in the early 1900s. I love stories of women and men who changed history even for a moment. Most of their names fade into the fabric of life, but every once in a while a writer like Shana Corey recognizes the bravery and boldness of the story and polishes it until it shines. Mermaid Queen shines as it tells the story of a feeble girl who grew up in an Australian household filled with music and dance. To make her legs stronger, Kellerman learned to swim, not the most fashionable sport of the time. But she made it her life, creating the first water ballet. She traveled to England and America dazzling her audiences with high dives and underwater dances, and shocking them with her daring bare-legged bathing suits. Single-handedly, Kellerman altered swimwear fashion from heavy woolen pantaloons to sleeker swim-friendly bodysuits. She was also ahead of her time promoting a healthy diet of fruits and veggies and vigorous exercise for women. She would have fit right in with Jillian on Biggest Loser. The text is spare yet lively and active, and the design of the pages swoop and swirl. Mermaid Queen can easily be an enjoyable read at bedtime, but can be so much more with the addition of Corey’s author’s notes that detail Kellerman’s struggles and successes. Another title to put on my list of books I wish I had thought of. At Books for Learning discusses The Honey Bee’s Hive: A Thriving City and some other bee picture books. Shelf-employed reviews Jean Fritz's book, Alexander Hamilton: The Outsider. Rasco from RIF has written about Chris Barton's intriguing new book CAN I SEE YOUR I.D.? True Stories of False Identities. There is a P. S. with a message from Chris about autographed copies of the book. Prose and kahn can be found at http://proseandkahn.livejournal.com/214969.html. I read The Far-Out Guide to Icy Dwarf Planets. Amanda at Patchwork of Books is talking about Into the Unknown by Stewart Ross... an awesome look into exploration for middle grades. The Wild About Nature Writers said -- It's another giveaway at Wild About Nature blog! This week, enter to win your own copy of The Robins in Your Backyard by Nancy Carol Willis. Jeanne Walker Harvey says True Tales & A Cherry on Top features just such a picture book biography about two English brothers who were innovative photographers and avid birdwatchers. They created the first nature book entirely illustrated with photographs. Looks like a wonderful line-up already this morning. Can't wait to check these posts. A great library non-fiction find - Owen and Mzee: The True Story of a Remarkable Friendship. This is a story about the unusual friendship between a baby hippo and a 130-year-old turtle. Geo Librarian reviews National Geographic Kids Everything Sharks at http://geolibrarian.blogspot.com/2011/04/nonfiction-monday-everything-sharks.html. Lynn Rutan and Cindy Dobrez said... At Bookends we are reviewing Albert Marrin's Flesh & Blood So Cheap: The Triangle Fire and Its Legacy. Thanks for hosting. Lori Calabrese said... Mermaid Queen sounds like an interesting book! Thanks for sharing! I just had the extreme pleasure of seeing some of the illustrations from my new book FOR THE BIRDS: The Life of Roger Tory Peterson. Laura Jacques, known for her award-winning artwork in Whistling Wings and Baby Owl's Rescue has once again captured the elegance, freedom and motion of birds, as well as the time period Roger grew up in. I can't wait to share her illustrations with you when the book comes out. But seeing them move from sketch to finished art reminds me of how much work and research goes in to nonfiction illustration. I know that I read all of Peterson's books and letters and journals in order to write about his life, but Laura had to see all of his paintings and photographs, but also discover details that would make Manhattan different than the Bronx, and a Luna moth separate from a Cecropia. I just had to write, "At eleven he was already in junior high school, and yet refused to walk in line with the other kids." But Laura had to show the line and figure out what those other kids would have been wearing in 1919. Last week I sat next to another amazing nonfiction illustrator, London Ladd, (March On: The Day My Brother Martin Changed the World, and Oprah: The Little Speaker) and couldn't help but over hear some of his conversations with readers. He liked to work from photographs and had to learn about the time period to be able to create the right scenes. One time he inadvertently put a ceiling fan into a room where there wouldn't have been any electricity. Nonfiction writers are not the only ones who lay awake at night worried about accuracy. To get Roger's story right, Laura relied on his own sketches that are housed in the archives of the Roger Tory Peterson Institute in Jamestown, NY, and pages written in his twelve-year-old handwriting. Some of these images grace the pages of the book. My favorite touch is on the back of the jacket. Laura re-created the trademark that young Roger designed for himself and drew in pencil on the back of one of his notebooks. A butterfly net, binoculars, a butterfly and a bird. The makings of a true naturalist. And it all comes to life thanks to an amazing illustrator - Laura Jacques. Nonfiction writers come from all walks of life. Hope Marston was an elementary school librarian before she turned to writing. The idea for her first book, Big Rigs, came to her because the boys at her school were always looking for easy-to-read books about big trucks. Timothy Burke was a tugboat captain operating in Lake Erie’s Buffalo Harbor. After hundreds of students visited the tug, he wrote Tugboats in Action. Carol Johmann was a research biologist before she wrote her first how-to science book for children; Steve Swinburne was a professional photographer; and Russell Freedman was a journalist. No matter what our backgrounds, nonfiction writers have one characteristic in common: We love to learn. Author Annie Dillard once described herself in her book, Pilgrim at Tinker Creek. “I am no scientist,” she said. “I am a wanderer with a penchant for quirky facts.” That pretty much sums up most nonfiction writers too. We are perpetual students of the world soaking up the odd, unusual, bizarre, and fascinating fact. We relish hearing about heroic deeds of the past or the recent discovery of a new drug from the Amazon. But we also love to shine a light on the ordinary things of life so that they gleam in a way no one noticed before. James Cross Giblin, author and former children’s book editor, wrote a fascinating book on the history of silverware. Common as this subject may seem, it would be hard to resist reading his book, Hand to Mouth: Or, How We Invented Knives, Forks, Spoons, Chopsticks, and the Table Manners to Go With Them. As nonfiction writers, we do all the things that everyone else does: We walk the dog, cook breakfast, and go on vacation, but we do these things with a built-in sense of wonder. Between the dog’s piddle stops, we might contemplate the bricks, cobblestones, or logs that lie under the asphalt. While cracking an egg, we might ponder the daily routine on an egg farm or how the gelatinous goo morphs into a chicken. We tend to plan our family vacations around research and interview trips. While nonfiction writers are perpetual students, we are also eager teachers. It is no surprise that many nonfiction writers once taught or still teach in a classroom, including Susan Campbell Bartoletti, Seymour Simon, James Deem, and Jean Fritz, to name a few. 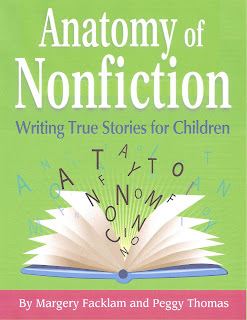 Many people have the perception that children’s nonfiction is unbiased or neutral, but it is not. Good nonfiction doesn’t just list cold facts, like a bedraggled witness interrogated by Dragnet’s Joe Friday, who was famous for the line, “Just the facts, ma’am.” What that witness said was filtered through her eyes, her past experiences, and her personal beliefs. So, too, is everything a nonfiction writer collects, reads, and writes. Nonfiction writers are biased. We can’t help it any more than anyone else can. Our bias is to present the facts through a hopeful lens. We portray a world where everything may not be perfect, but with hope that someday it will be better. As naturalists, we could not write about the deforestation of the rainforest without talking about the efforts of coffee companies attempting to grow coffee beans in an environmentally sound manner. We need to give hope to the next generation, and perhaps inspire them into action. Through our writing we show that there are difficulties to overcome, whether that means learning how to be a better baseball player or saving wild manatees. We provide hope and motivation by telling true stories of others who have struggled. 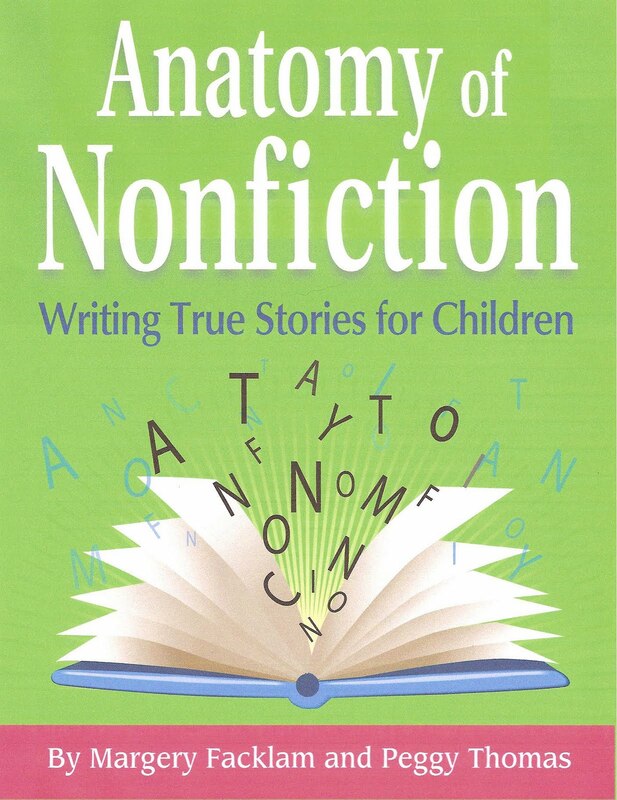 In that respect nonfiction writers are like classroom teachers, librarians, and parents. We are committed to shaping a better world for children. Does this description of a constant learner and hopeful teacher sound familiar? Then you may be just right for this fascinating profession of nonfiction writing. Anatomy of Nonfiction: Writing True Stories for Children, published by Writer's Institute Publications, 2011. Ever wonder where other writers get those amazing stories of 9-year-old Union soldiers or twins fighting on opposite sides? They usually find these nuggets of an idea sifting through old censuses and military records. You can do the same thing. Starting Thursday, April 7th, Ancestry.com is offering free access to millions of Civil War era records, including the 1860 and 1870 U.S. censuses. Free access ends April 14th, so, make the most of this opportunity. Browse through history and uncover the story that no one else has written yet.